Let’s play a game. What is thirteen feet tall, bipedal, and with scales all over? No idea? Okay, what is snake-like, but with flippers, and black fur all over? Not quite? What is essentially an enormous dog, only aquatic and possibly covered with feathers or featuring tusks? Still don’t get it? Surprise! This is the same creature, one and all. Regardless of how it’s appeared, this puppy has been terrifying Australians for some 50,000 years, ever since they first arrived on the continent. It lurks in the swamps, riverbeds, and billabongs;* howls in the night; and has a hunger for human flesh–especially that of women and children. Ladies and gentlemen, meet…the bunyip! The stories surrounding this terror are only slightly more straightforward than its physical description. 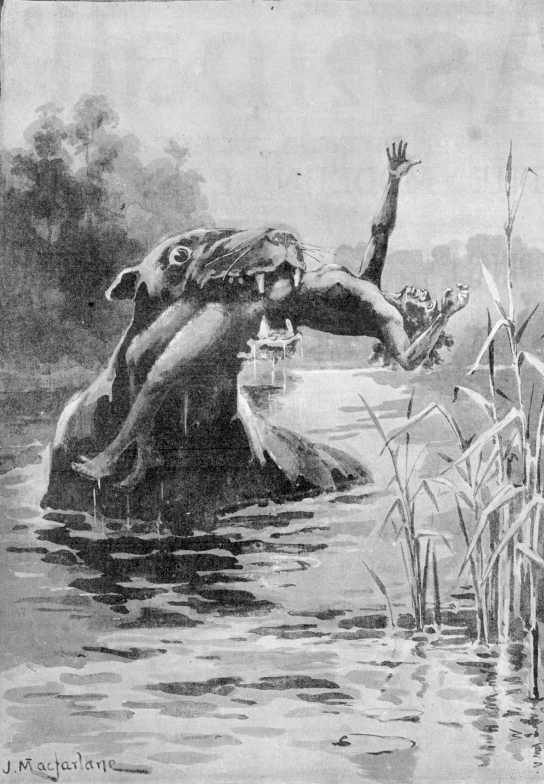 The bunyip was said not only to kill people by eating them, but to crush them to death with its arms. Indigenous Australians thought the bunyip to be a malevolent spirit from the Dreamtime, the realm in which earth itself was created. As such, it was purported to have supernatural powers, and on a continent full of things that can easily kill you, it scared some people so bad that they would actually avoid water sources for fear of falling in its clutches. Some have suggested that this might account for its varying descriptions–if a person was lucky enough to run into a bunyip and survive, she was likely too afraid to have taken careful stock of what the thing actually looked like. They weren’t the only ones talking about it. In 1852, escaped convict William Buckley returned from his adventures living with the Wathaurong people to write a memoir. He himself had seen the bunyip several times–but only a large back drifting through the water, never a tail or head. He, too, knew of a woman who had been killed by one. But even as the settlers were infected by bunyip fever, descriptions–and interpretation of–the creature began to change. 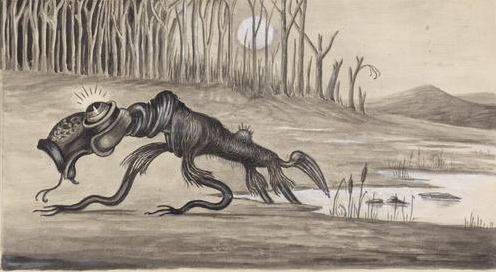 In a rash of sightings in the 1840’s and 50’s, the bunyip went from being a horrifying supernatural predator to a shaggy herbivore the size of a large dog. In March of 1846, the Port Phillip paper reported the sighting of a bunyip (or an immense platypus) sunning himself on the side of the river Yarra. A crowd gathered and a team went to investigate, but the creature disappeared when they came within a few feet away. In 1852, a pair of friends canoeing on Lake Tiberias actually bumped into a bunyip with their boat, whereupon it simply turned and swam out of sight. As the years passed, the bunyip got even smaller–on one occasion in 1886, a couple of horseman came across one near a river, and threw rocks at it to drive it away. A lack of recent sightings has led some to believe that if the bunyip did exist, it’s gone extinct. But with such a long and complex history, it would be foolhardy to say that nothing could have existed at all. Even if you disregard supernatural explanations, the bunyip still represents a cultural terror passed down over millennia–a terror that might have been carried over from something very real. It could have been from something as simple as the saltwater crocodile–a known aquatic mankiller–but there were other, bigger things around when humans first arrived on the continent. Take the Diprotodon, the largest known marsupial to have ever lived, who could have existed alongside humans for as much as 20,000 years and whose name means “two forward teeth.” This is the creature crytozoologists point to most often as the inspiration for the bunyip, but there is also the Nototherium, the Zygomaturus, and the “ancient leaper” Palorchestes to consider. Then we have the theory that for later sightings, witnesses might actually have encountered escaped convicts skulking in the swamp. Nicknamed swaggies, these fellows would evade capture by hiding out in one of the more inhospitable environments of Australia, only to rise, dripping and covered with muck, when the coast was clear. If the observer were forced to choose between that and a supernatural man eater, in theory the former would win, but it’s difficult to say by what margin. Have you ever seen a bunyip? Perhaps in your local sewer drain, creek, or the quagmire of your neighbor’s overwatered yard? Share your story in the comments below.